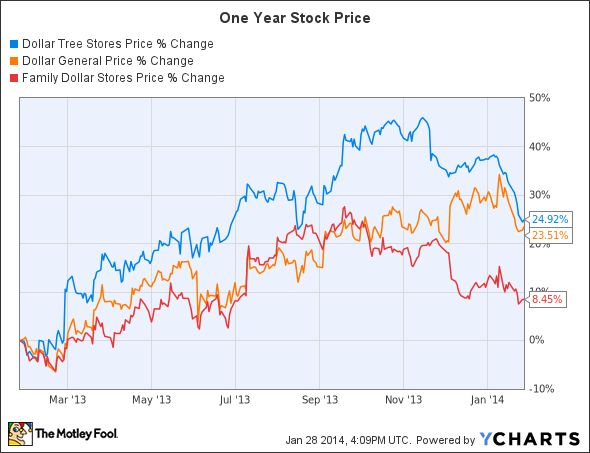 Despite making a number of efforts one dollar store is unable to outperform its peers. According to Gallup, consumer spending reached an average of $96 per day in December, the highest level reached since the recession. This indicates that consumers are spending more than before, and retailers should now find more people in their stores. However, this does not seem to be the case for Family Dollar Stores (UNKNOWN:FDO.DL). The company is going through a difficult phase wherein lower customer traffic recently led to a disheartening quarter. Its first-quarter numbers did not meet the Street's expectations, leading to a drop in the stock price. Revenue grew 3.2% to $2.5 billion over last year. However, this increase was not accompanied by growth in sales at existing stores--it was driven by 126 new stores opened by the company. In fact, same-store sales fell by 2.8% as store traffic and average transaction size decreased. Hence, the retailer was unable to lure customers into its stores. There was 4.7% growth in consumables sales, which was was offset by a performance decline in the apparel and accessories segment. Growth in the consumables segment was mainly due to the company's focus on frozen food as well as products such as tobacco, which boost sales. In fact, adding tobacco to the product portfolio has also been beneficial for Dollar General (NYSE:DG), which is witnessing increasing revenue driven by higher sales of tobacco. Furthermore, demand for tobacco led to a 12% sales increase in its consumables segment. Also, consumers who visit the store to buy tobacco also buy other products, adding to Dollar General's performance. Although Family Dollar tried to attract cost-conscious customers by offering discounts, it could not meet analysts' expectations. Its earnings for the quarter dropped to $0.68 per share as compared to $0.69 per share in the year-ago quarter. Family Dollar has been a laggard on the competitive front too. Along with lackluster numbers, the company has offered the lowest returns to investors as compared to its peers such as Dollar General and Dollar Tree Stores (NASDAQ:DLTR). Dollar Tree has provided the highest return of 24.9% in the last year. The company's success lies in its efforts to focus on private-label products, which leads to higher margins. Also, its strategy to sell products for $1 has attracted customers in hordes. Dollar Tree is also concentrating on the frozen-foods segment, and therefore the retailer provides tough competition to Family Dollar Stores. This led to same-store sales growth of 3.1% in Dollar Tree's last reported quarter. Dollar General's stock price has appreciated by 23.4% during the same period. The retailer has been growing well with new store openings accompanied by same-store sales growth. In its last quarter, Dollar General's top line surged 10.5% over prior year's quarter, driven by new stores opened and growth of 4.4% at its existing stores. One of the key reasons for this great performance was the addition of tobacco, which increased store footfall. Family Dollar is indeed making a number of efforts, which seem to be falling flat in the presence of such tough competition. It undertook a number of promotional activities during the holiday season such as providing a 70% discount on the second purchase and special $5 deals for toys. It also entered into a partnership with McLane so that it can further strengthen its frozen-foods segment. Moreover, Family Dollar has been expanding its footprint by opening new stores. In fact, it plans to open 525 new stores during this year. However, this might not be a wise decision since sales at existing stores have been declining. Also, the company is focusing on private brands in order to boost its margins as well as the top line. Family Dollar also announced its plans to return to its everyday- low-prices strategy, which should bring in more customers, especially the ones who are price sensitive. The retailer is making a number of moves to revive falling sales. It has been opening new stores and renovating existing ones. Moreover, its promotional activities should also help drive sales. However, it is difficult to say how things will unfold, especially given the stiff competition by other industry players. Hence, this is definitely not the right time to jump into this company. If dollar stores interest you, then Dollar General and Dollar Tree are better picks.